A postcard of the Hillview Apartment Building, from the California State Library. Long an elegant sight on Hollywood Boulevard, the Hillview Apartment Building’s (now the Hollywood Hudson Apartments) central location in Hollywood and its graceful look attracted entertainers of all fields looking for a comfortable but stylish home. Almost 100 years old, the structure still operates as an apartment building for those trying to climb the rungs of the Hollywood entertainment ladder. Hollywood functioned mostly as a sleepy little farming community until the moving picture industry discovered it in the 1910s, turning the burg into a busy industrial center by the early 1920s. Movie-struck people from around the country poured into the community hoping to gain their fame in the Hollywood game. As the town grew, its main street, Prospect Avenue, filled with stately Victorian mansions and parks, evolved into the commercially driven Hollywood Boulevard. Between 1915-1935, Hollywood Boulevard between Argyle Avenue and El Centro functioned as the film industry’s main street, a prime shooting location, entertainment center, and shopping mecca. The Hillview, 6553 Hollywood Blvd., via Google Street View, 2009. Originally a real estate office, 6533 Hollywood Blvd. was purchased by William F. Tifal, who requested a permit from the Los Angeles Planning Department on April 30, 1917, to construct a four story apartment building with brick walls. Tifal and his brothers Charles and Gustav owned a construction company downtown. He soon started what seems to be a never ending process for the building: turnover of ownership as well as turnover of address, ranging from 6529 to 6533 Hollywood Blvd. It appears that the lot sat empty until 1920, when new owners H. Goldman, S. Rabinovitz and Famous Players-Lasky co-founder Jesse L. Lasky decided to complete the project. They pulled a building permit on June 29, 1920 to “complete and finish a 4-story tenement house” according to previous plans, but converting an office into storage and reducing the size of closets by adding built-ins, under the direction of contractor Halton Brown. Worked included furnishing pipe to drain water. Because of its central Hollywood location and special amenities, one can assume that the owners hoped to attract successful stage and film people from the East Coast looking for a new home in the thriving moving picture community. The new Hillview Apartments announced their opening with a large advertisement in the November 13, 1920, Los Angeles Herald, with a lovely illustration of the striking Mediterranean Revival building listing “restricted exclusive apartment homes.” These were not just apartments for lease; individuals could also purchase units to live in or as an investment on the co-operative plan. The ad pointed out its central location in Hollywood near schools, churches, theatres, and streetcars and that every apartment on the second through fourth floors possessed great views of Hollywood. The prime location on Hollywood Boulevard adjacent to the streetcar line served as a major plus for those without automobiles. The Hillview in the Los Angeles Herald, Nov. 13, 1920. Apartments cost anywhere from $16 to $24 a month for purchase, or $125 to $200 a month to rent, pretty steep for those days. Owners would put 25% down and pay 1% each month towards the purchase price, with down payments starting at $4,000. Most units ranged from two to four rooms, wih each unit containing its own bath. The Hillview possessed outstanding, up-to-date amenities like writing room, ballroom, billiard room, large parlor lobby, ladies’ waiting room, dressing rooms with mirrors, breakfast nook, steam heat, incinerators, refrigerators, automatic elevators, French doors, indirect electric lighting, large closets, hardwood floor with carpet optional, artistic decorations, and interior finish of mahogany or ivory. Apartments featured built-in ironing board, medicine cabinet, and breakfast table and seats. On December 30 of that year, operating under the name Hillview Apartments, the owners requested a permit for Haupt Construction Company and Trifell Brothers’ architects to install a sprinkler system, drainage, and adjust a store area near the entrance. Southwest Builder and Contractor also lists that Haupt Construction Co. will be repairing 6529 Hollywood Blvd. By July 1921 Herman Fisher becomes the owner, and he hired architect Charles Plummer to add new plumbing and work on drainage and by October 28, 1921, permits list G. Norman as owner. J. M. Neland served as owner for a period of time in 1922 and E. H. Bransatter became the new owner in 1923. Stores begin opening in the lobby of the building to serve its successful clientele in 1921. Cawston Ostrich Farms operated a branch of their successful fashion line here, and City Dye Works opened a dry cleaning business that remained open for more than 10 years. Smith and Sons ran a shoe repair store for a short time, and the Mensa Hungarian Restaurant served meals for a period of time beginning in 1929 as well. City Directories list Mrs. Nellie Deering as manager of the building from 1923-1925. Evelyn Brent films closeups while living at the Hillview because she is too ill to come to the studio, Exhibitor’s Trade Review, Sept. 1, 1923. Reaching out further to the moving picture crowd, the Hillview Apartments announced the opening of the Hillview Grill with an ad in the May 12, 1923 issue of Camera under the management of Mrs. Ella Klumb. Prominently mentioned that the restaurant operates “Especially for Motion Picture People, the ad lists Mrs. Klumb’s wide experience and the delicious home-cooked meals the cafe offers. Service included a merchant’s lunch from 11:30 am to 2 pm and dinner from 5:30 pm to 8 pm. Unfortunately the Grill operated only a few years. Film folk flocked to the building. Fan magazines list such people as Mae Busch, Viola Dana, Alice Lake, Evelyn Brent, and Billie Dove living in the Hillview. Motion Picture magazine in a May 1922 story mentions interviewing Lake and Dana in the lobby of the structure, and the September 1, 1923 Exhibitor’s Trade Review displays a photo of a cameraman shooting closeups of Miss Brent in her room for the Metro film “Held to Answer” when doctors forbade her to going to the studios when ill. They claimed that the six close-ups required to finish the film and shot in the apartment represent the first of its kind in completing a picture. Many films shot around the apartment building thanks to its location on Hollywood Boulevard. Comedian Lloyd Hamilton shot scenes for “My Stars” on the street near the building in 1926. Robert Florey’s 1936 film “Hollywood Boulevard” features the building in its location shots around the film center. Newsreels and other films probably showed it in tracking shots and drives down the boulevard as well. As the studios begin moving away from the heart of Hollywood, businesses all along Hollywood Boulevard suffered, and the city began its slow decline. Film people begin moving into their own homes in the hills and away from the Boulevard, with the Hillview losing its more successful clientele. By the mid-1930s, most residents appear to be mostly long term residents and more middle/bottom rung performers, with some even taking out ads announcing that they offer singing/voice/music lessons out of their apartments. Doria Ball Weaver’s February 9, 1930 advertisement in the Los Angeles Times states that she is taking voice pupils between films. In the 1940s, the Hillview operated as much as business locations as home locations, with ads and listings in the city directory showing this trend. A listing in the February 18, 1945 Los Angeles Times reported that the USO operated out of the building’s basement. A July 16, 1947, building permit reveals that Mills Music Publishing would alter apartment #202 into an office. Music publishers, optometrists, chiropractors, composers, and the like run ads in Billboard, trade magazines, and newspapers. The American Hospital Association rented a space to offer free diphtheria shots for a month in 1948. Possibly to help its own business prospects, owners requested a permit on August 7, 1950 to install a neon sign atop the building. Long term residents also begin dying in the late 1930s and 1940s. Composer Harry Cokayne died in his residence in November 1938. Madame Cecille Lorraine, an opera singer who sang at a command performance for Queen Victoria, died in her apartment February 13, 1941. Just as the permits announce changes in ownership, they also reveal lack of care, caused by foolish handling of cigarettes or hot plates. Owners pulled a 1936 permit to repair fire damage on the first floor. In 1947, another permit is pulled to repair fire damage in apartment 205, followed by repair work for fire in 1949. Los Angeles Times, May 8, 1921: An ad for Cawston Ostrich Farm includes a location at the Hillview. Police arrested tenant William Francis Paul on March 9, 1962, after Mary Pickford reported that her former butler had absconded with a 25 carat sapphire ring given her by Douglas Fairbanks. In court, Paul testified that he merely took the ring to Zurich, Switzerland to obtain a correct appraisal, but unfortunately the newspaper does not reveal the ending to the case. By the late 1980s-early 1990s, the Hillview declined into a shabby shadow of itself along with the rest of Hollywood Boulevard, as drug dealers and transients took over the area. Mostly elderly residents lived in the building, which suffered major damage from subway construction, the Northridge earthquake, and an arson fire. Under the threat of possible demolition, new owner Jeffrey Rouze rehabilitated and renovated the building and reopened it as the Hillview Apartments on July 14, 2005, recognizing the distinguished history of the structure. Forced into foreclosure due to poor business, new ownership took over in 2010, before another change a few years later. They too attempted restaurants and a speak easy in the building, which failed to catch on. Pretty in pink, the Hollywood Hudson Apartment building still provides a lovely look back at Hollywood’s glorious past, when Hollywood Boulevard reigned as one of the world’s most important streets. 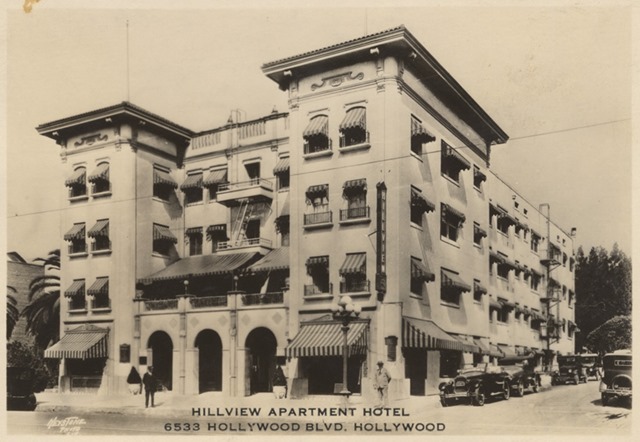 This entry was posted in 1920, 1921, Architecture, Hollywood, Hollywood Heights, Mary Mallory and tagged #Hollywood Boulevard, 1920, architecture, hollywood, Hollywood Heights, Mary Mallory. Bookmark the permalink. “restricted exclusive apartment homes.” is real estate code for what usually meant no Blacks, Jews, and Asians allowed. Although due to the building being partly owned by Jesse Lasky, Jews must have been given special dispensation. Real estate double-talk is alive and well today. Terms such as ‘old world charm’ to mean a dump. And ‘mid-century charm’ for hastily constructed, badly kept up, monomania.